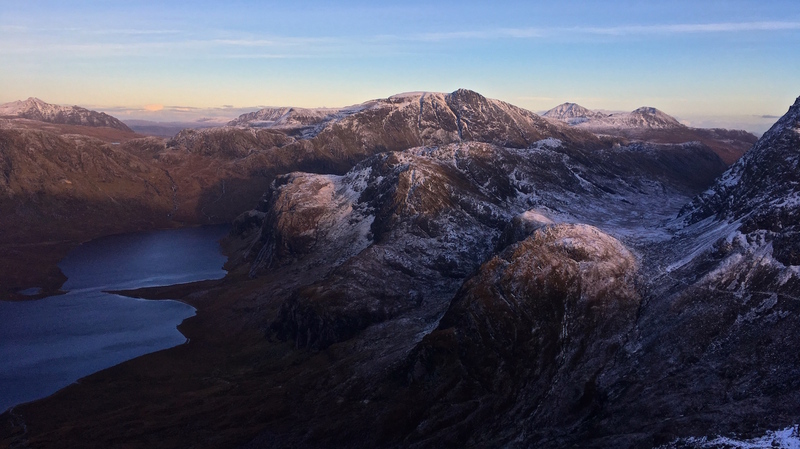 King Mountaineering has a range of walks planned throughout the year, with a variety of day walks, walking holidays and multi-day backpacking adventures across the Scottish Highlands. Many trips aim to take-in Munros, Corbetts or other principal summits while others will tackle low-level or long distance routes, all visiting some of Scotland’s most spectacular landscapes and many of its wilder corners. See below for our planned events for the year ahead, ranging from 1-day events to multi-day backpacking adventures. For more details about each event, click on the link or to make a booking, please get in touch. Remember, bespoke guided trips to other hills and hill areas are also available, so if you see something on this page that you’re interested in but have other dates in mind, or you have a different route you’d like to tackle, just call or email to discuss. The Fannaichs are a fantastic high-level ridge of 9 Munros located in Wester Ross. They are a varied group from rounded hills with grand corries, reminiscent of the Eastern Highlands, to shapely, pointed peaks more akin to the rest of north-west. We’ll aim to summit all these Munros over the course of a 3-day long weekend. These walks include a wide variety of terrain type. Most of the walking will be on paths but there will be some boggy ground, with rough pathless stretches. A good level of fitness will be required. Foinaven is one of the great ridges of far north Scotland. It is more a mountain range than a single peak and towers over the surrounding summits almost to Munro height. This day will aim to traverse the ridge from Achfary in the southeast to Gualin in the northwest. This will be a full day out in the mountains along a fairly narrow ridge with rough, rocky going underfoot requiring some care and a good level of fitness. This trip will be a 3-day wild-camping trip taking in all five of the Fisherfield Munros, considered to be the remotest Munros, and a sixth top, Beinn a’ Chlaidheimh (formerly a Munro, but now a Corbett). These are mountains of real character in a wild setting and offer one of Scotland’s best mountain journeys. Good paths lead into the hills, followed by rough, mostly pathless ground on the hill with some steep ascents over rocky ground. There are at least three major river crossings. A good level of fitness will be required to undertake the long distances covered in this expedition and extra kit and food will need to be carried for the overnight stops. A 2-day trip to Scotland’s far north, visiting the 4 most northerly Munros and experiencing some of Scotland’s wildest landscapes.